Harold Covington, the founder of a white separatist group who once claimed that Dylann Roof’s massacre of nine people in South Carolina was “a preview of coming attractions,” has died. He was 64. Covington passed away on July 14 in his apartment in Bremerton, Washington, the Kitsap County Medical Examiner told Hatewatch. The Northwest Front, the group Covington founded and led until his death, did not announce his death until Tuesday. Covington was notorious in American neo-Nazi circles. While his ideas for a white ethnostate continue to energize the racist “alt-right,” his death may mark the end of the Northwest Front. 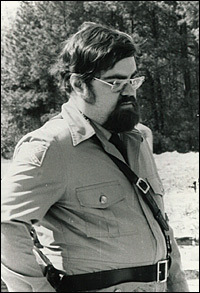 A long-time member of the National Socialist Party of America (NSPA), Covington spent decades attempting to further racist causes, including working in the former African nation of Rhodesia to preserve white rule and advocating a plan to turn the Pacific Northwest into a white homeland, an idea also known as the Northwest Territorial Imperative. For Covington, it was an effort that spanned most of his life, beginning in 1971 when he graduated high school and joined the U.S. Army. That year he also joined the National Socialist White People’s Party, the political successor to the American Nazi Party. Two years later, though, he was discharged from the army and began roaming the world espousing racial separation. “Within a month after his discharge from the army, Covington landed in Johannesburg, South Africa. It was nothing short of racist heaven. White supremacy. Apartheid. Covington worked as a payroll clerk by day, studied Hitler at night, and dreamed of leading the revolution –– the national socialist revolution,” Elizabeth Wheaton wrote in Codename Greenkil: The 1979 Greensboro Killings, which recounts the aftermath of Klansman and Nazis attacking an anti-Klan demonstration that left five members of the Communist Workers Party dead. Covington was part of the group, but he wasn’t in attendance the day of the violence. In 1974, Covington left Johannesburg for Zimbabwe, then called Rhodesia. There, he claimed to have been a mercenary in the Rhodesian Army, to have organized a Rhodesian White People’s Party and to have been expelled from the country in 1976 because “his brand of racism was too vile for even the white supremacist Rhodesians,” Wheaton wrote. His activism, though, was soon replaced by writing, including campy occult novels including The Black Flame, a story that details a “demonic new world order” characterized by gender equality, social tolerance and individual rights. In his life, Covington crossed paths with several racist killers through the years, including Frazier Glenn Miller, a one-time colleague in the NSPA who killed three people at a Jewish community center in 2014 and Dylann Roof, who killed nine church congregants meeting for Bible study in Charleston, South Carolina in 2015. They will see in that young white man’s eyes, that he recognizes them, that he is now beyond deception or bullying or browbeating or Twitter-shaming or intimidation, that he knows them for what they are. And they will look down and see that he has something in his hand. Despite his importance in earlier eras, Covington had lost considerable influence as new leaders emerged with the rise of the "alt-right." As of Wednesday, a thread on Stormfront, once the largest white supremacist website on the internet, had only nine posts commenting on Covington's passing. Some even struck a dismissive chord. "I thought he was an impediment to unifying Whites into a larger and better Nationalist organization," a user named "Defend our Homeland" wrote. "[A]lthough I appreciate his being a Nationalist, Northwest Front members are encouraged to drop out of this group if it even still exists and find something better."